Tonsillitis is one of the most common reasons that children see a physician. Most children will experience several bouts of this disorder in their lives. The majority of tonsil infections are treated safely and easily with antibiotics. Adults can also suffer from tonsil infections, but less frequently than children. The tonsils are paired lymph tissue in the back of the throat or oral pharynx. They serve as place where the body begins it’s fight against infection from viruses or bacteria that enter through the mouth. In response to infection, the tonsils swell and can become covered in pus. People also can develop fevers and pain with tonsil infections, as well as body aches, chills and enlarged neck lymph nodes. Many organisms can cause tonsillitis. Viruses and bacteria are the most common, with group A beta-hemolytic streptococcus being the most well known. Strep throat, as it is known, is a tonsil infection from a very specific bacterium. This bacteria if untreated, can cause heart or kidney problems in some patients. For this reason, antibiotic treatment is suggested for all strep throat infections. Other common tonsil infections include the virus that causes mono, the Epstein-Barr Virus. Chronic tonsil infections can result in chronic sore throats, bad breath, tonsilloliths (white food debris in the tonsils), or chronic neck lymph nodes (swollen glands). Antibiotics can be helpful in some situations. Tonsils can also enlarge to the point that they can cause an obstruction to ones breathing, especially at night. Enlarged tonsils can also cause difficulty with clear speech or normal swallowing. If untreated some tonsil infections can go on to become a peritonsillar abcess, which is a collection of infected fluid next to the tonsil in the throat. A peritonsillar abcess should be suspected when the pain in the throat is getting worse, even after taking antibiotics, when you are unable to fully open your mouth, when the voice becomes muffled, or when the pain remains on one side after several days. 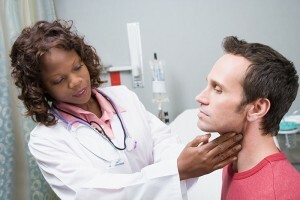 Some people suffer from recurrent tonsil infections, chronic infections that never resolve, or enlarged tonsils that do not respond to medical therapy. For these people, surgery is sometimes needed to resolve their symptoms.